ATCHISON — February snow brings March floods. While not as quippy as “April showers bring May flowers,” it is too true this spring. 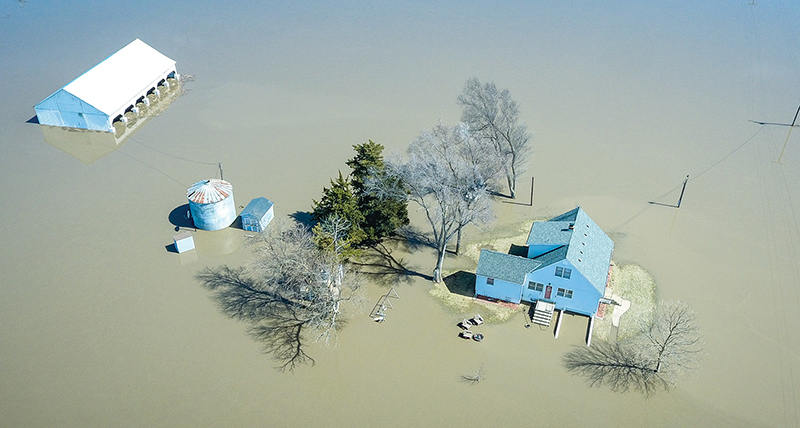 For over half of March, much of the Midwest has experienced intense flooding due to rising water levels in the Missouri River — including many towns and families in the archdiocese. Weeks ago, the National Oceanic and Atmospheric Administration predicted a high probability for flooding this spring due to large amounts of heavily packed snow in the northern states. Then came the “bomb cyclone” that hit the Midwest March 13, which brought record low pressure and rain, causing snow to melt in the Rocky Mountains and Plains, swelling the Missouri River. Huge volumes of runoff poured into the Missouri above the Gavins Point Dam in South Dakota, in particular, which is about 400 miles upstream from Kansas City. In an effort to save the levees and prevent potentially worse flooding, the U.S. Army Corps of Engineers released water from several of the dams, including Gavins Point. As a result, over 20 levees along the river failed, several of which are located near Atchison. Billie Peltzer, a parishioner of St. Benedict Parish in Atchison, is one of the many who has been affected by the flooding. Peltzer and her family live in Platte County, four miles directly south of the Missouri River bend. By March 21, five area levees were breached, including: the MRLS 500R in Doniphan County, the Grape Bollin Schwartz in Atchison and Leavenworth counties, the Bean Lake in Platte County, the Rushville Sugar Lake in Buchanan and Platte counties, and the Henry Pohl in Atchison County. And the Missouri River at Atchison rose to 31.2 feet March 21, too, just below the 31.63-foot record set in July 1993. Lucky for the Peltzers, a farmer friend who is on the levee board warned them to be ready to evacuate a week before the levees broke. Others had to rely on their experience to warn them. Bill Ewing, also a St. Benedict parishioner, owns Whiskey Rebellion liquor store on Highway 59 just east of the Atchison Amelia Earhart Bridge. He received no formal flood or evacuation warning — but, thankfully, he and his family were well-versed in reading the signs of flooding. “Once the river gets to about 29 feet, that’s usually go time,” said Abby Kessinger, Ewing’s daughter and office manager at Maur Hill-Mount Academy, Atchison. On March 15, Kessinger, Ewing and their family held a sale, selling much of their inventory at cost. It was a race to move the inventory out before the electricity was cut and the water crept over the roads. By March 16, they locked the store’s doors and hoped for the best. In the meantime, Peltzer and her family had taken shelter with her husband’s parents in Atchison. And there is no telling how long they will be displaced. Ewing agreed, remembering the hardships the 2011 flood brought. For Peltzer, flooding means much more than lost items and additional expenses. Peltzer also expressed disappointment in the Army Corps’ control of the Missouri River dams. Peltzer attempted to assess her home’s situation on March 22. A drive that normally takes Peltzer five minutes took an hour, as she had to navigate back roads around the flooding. She got close enough to see the house was still standing, but couldn’t see if it was filled with water. Just then, a man with a camera-fitted drone came by, so Peltzer asked him to fly it over her house. The camera showed the house still standing, surrounded by a small patch of grass. The water hadn’t overtaken it. Peltzer was relieved. The Missouri River flooding has covered over 35,000 square miles and has impacted more than five million people, according to the National Weather Service. These floods have caused an estimated $3 billion in damage across Kansas, Missouri, Nebraska and Iowa, leaving many towns navigable only by boat. The flooding even contaminated the water in the city of Atchison, which issued a water boil advisory March 19-22. And Kessinger and Peltzer, despite their hardships, consider themselves among the lucky. Many area organizations and schools — including Catholic Charities of Northeast Kansas, St. Benedict Elementary School and the Salvation Army — are collecting items to provide aid and support for flood victims.